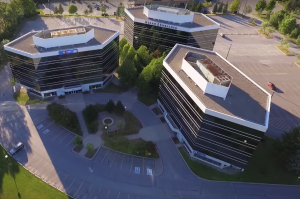 Part of the Gateway Business Park (name derived from the Gateway to Kanata North), this Class “A” building features excellent exposure along March Road. Easy access to Highway 417 with public transit steps away and free surface parking. On-street bike lanes and biking trails around the corner and throughout the area lend itself to the workstyle environment. This business park is steps away from two shopping plazas complete with bank, restaurants, grocery store, post office, pharmacy and hardware store. This building is one of three towers comprised of 6 storeys and boasts 121,135 rsf. Constructed in 1988, its elegant curtain wall facades are supported by steel framing throughout. The high-visibility location is ideally situated for consumer-oriented businesses. Open-concept office space with some private offices.